Verifaya Functional Testing Services ensure the verification and validation of applications for software development teams. The functional testing services focus on testing the applications against defined specifications and meeting the end user expectations for functionality, reliability and go to market. Verifaya engages with clients at various stages of SDLC, in order to meet business goals. Verifaya uses best industry practices to analyses test requirements, test design and test execution phases. Verifaya testing expertise help clients with unit tests, integrations tests, system tests regression tests and user acceptance tests etc. Verifaya’s Performance Engineering teams have extensive experience in providing Performance engineering solutions. Verifaya’s Performance Testing expertise spans across range of applications including client-server, web, distributed, mobile, cloud databases, high volume transaction systems, and complex applications. Verifaya’s end-to-end performance testing solutions helps our clients to launch applications with high reliability, availability, and scalability. Verifaya’s performance engineering, including capacity planning, baseline test, load, stress, endurance and benchmarking against competition, production monitoring and consulting, Comprehensive analysis and recommendations for performance improvements. Verifaya’s performance engineering team has expertise is using open source tools, custom tools and high end industry leading tools like Load Runner. Verifaya has expertise in Security Testing of enterprise applications, cloud platforms that caters to diversified business needs. Verifaya believes that Security Testing has to be an activity, that is fully integrated throughout the Software Development Life Cycle (SDLC) and delivery process which ensures detection of errors /faults in the early. IBM Rational App scanner, HP Web inspect, HTTP Watch and other open source tools like Web Scarab, Net Craft, Tamper Data, N Map, Web code, Nessus etc..
Verifaya provides comprehensive Compatibility and usability testing services that can be performed across range of Operating Systems, browsers, databases, servers, hardware, different versions, configurations, and display resolutions. Verifaya lab houses latest operating systems, platforms, peripherals and hardware to test software over a wide range of technical specifications. Verifaya has in-house Test Engineers, Test Leads and Managers, with expertise in manual testing, automated testing, performance engineering. Testing teams are well versed with open source tools, commercial tools and also custom tools. Verifaya’s strong network has access to special testing skills as required for our client success. Verifaya offers mobile testing services functional and non-functional and automated testing of mobile applications both Web, Native and Hybrid. Verifaya has experience in mobile testing for various domains such as banking, Retail, healthcare etc. Verifaya’s expertise in mobile testing cuts across industry standard tools and Verifaya platform. DevOps has been adopted by fortune 1000 companies in order to build more fail-proof software with shorter go to market cycles by collaborating with all stakeholders. Even Small and Medium Enterprises (SMEs) are gradually embracing DevOps standards to take advantage of cross-functional skills. Testing teams also are actively integrated into DevOps for accelerated test cycles. Verifaya has been a test automation company, with Verifaya platform as its flagship product for automated testing, is well geared up for DevOps testing. Verifaya’s expertise in automated testing helps software development teams to accelerate test cycles, in DevOps environment. Verifaya has ability to provide testing services at various stages of ETL process. 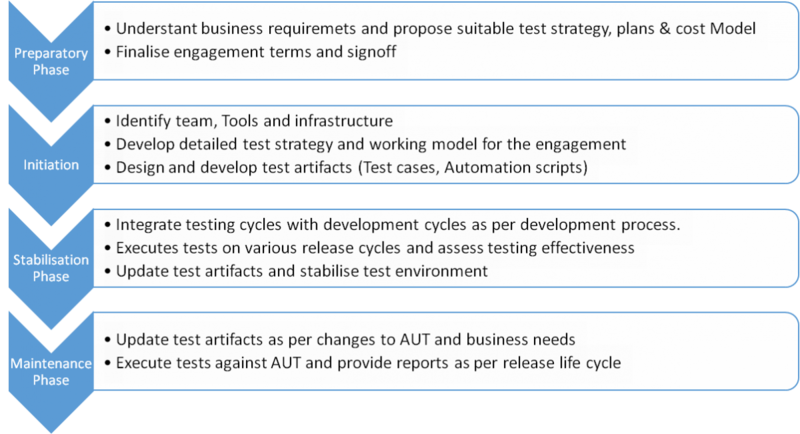 Typical testing ranges from Production validation testing, Source to target testing, Application upgrade tests, Date completeness, Data accuracy and data quality tests etc. Verifaya has extensive experience in testing Salesforce applications. Verifaya’s has the ability to provide Manual and automated test solutions for Salesforce applications. Many organizations struggle to establish and manage a testing function that can deliver high quality testing phase, while staying cost effective and agile. Verifaya’s Managed Testing Services provide a transformational approach with the appropriate test team, processes and environment specific for the business. Verifaya can help you overcome today’s major testing challenges and achieve the optimum results. Verifaya has robust test process and methodology to manage independent test activities. 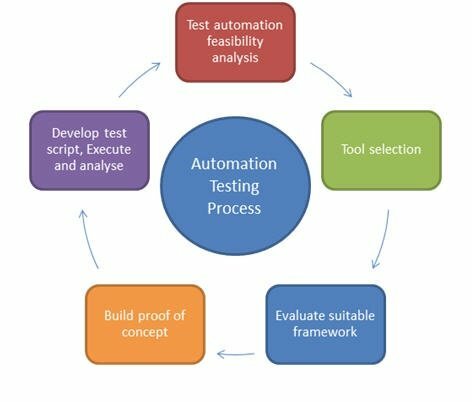 Test Automation has been an important component of test life cycle over years. With impetus on agile development, DevOps, automates testing has become inevitable component of testing programs and software development. Verifaya is an automation testing company with Verifaya platform, a comprehensive automated testing solution for Mobile, Web and desktop applications across business verticals. Verifaya’s automated testing solutions using open source and commercial tools to provide optimized test solutions across business verticals and specific client needs. Verifaya has the ability to customize testing tools to solve complex testing challenges has been exemplary. We offer an end-to-end fully customized service where the responsibility of application testing is taken at an enterprise or program level. Many business situations like Test Experts at a very short notice, tight time lines for product or software release, test resources & QA budget constraints can call for on-demand testing services. Verifaya can become your on-demand testing/QA partner to deliver functional & non-functional testing services based on your business needs. Our on-demand services can help to achieve your project goals by using our network of talented Testing Experts across tools, technologies and business domains. Acceptance & last-mile testing which requires special testing & domain skills. Test automation on commercial & open source tools.